Marketing students are encouraged to use many resources to enhance their marketing education. Student involvement with marketing organizations enriches course learning and provides experiential learning opportunities. There are several organizations available to students with an interest in marketing. 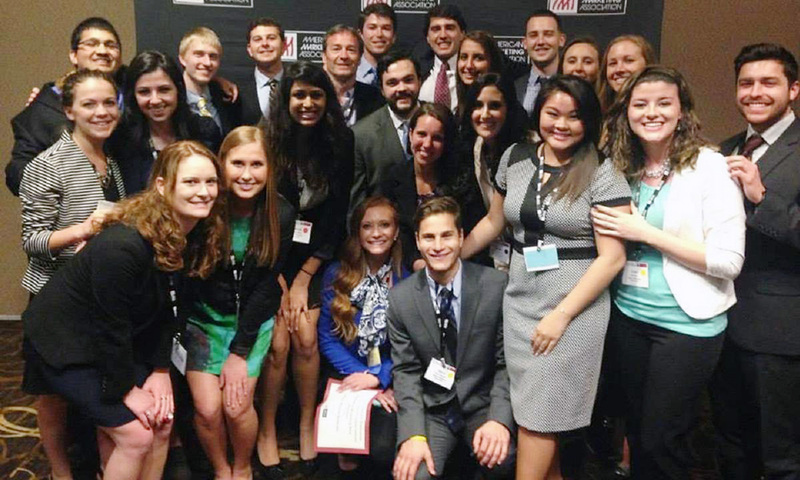 The American Marketing Association at James Madison University is a Top 15 Chapter of the AMA (out of 400+ chapters). Founded in 1982, the JMU chapter of AMA is a student-run, nonprofit organization with the purpose of providing members with the knowledge, skills, opportunities, and connections to be the best professional possible in their future careers. AMA strives to create opportunities to learn and implement marketing principles through professional speakers, a consulting division, competitions, fundraisers, and preparation for the AMA’s International Collegiate Conference in New Orleans. All majors are welcome! For more information visit their BeInvolved page. Collegiate DECA is a student driven organization that values competence, innovation, integrity, and teamwork. DECA prepares students for careers by integrating skills learned in the classroom into real world experiences. Collegiate DECA programs assist in developing academically prepared, community oriented, professionally responsible, experienced leaders. DECA students major in a variety of academic programs with a strong focus on business-related fields. Collegiate DECA conferences and other activities give students unique access to internships, scholarships, competition, and professional networking. The Madison American Advertising Federation (MAAF) is JMU’s only student advertising organization and a student chapter of the American Advertising Federation (AAF), the oldest national advertising trade association, representing 40,000 advertising professionals. Every year, a team from JMU’s MAAF competes in the AAF’s National Student Advertising Competition (NSAC), an intense, first-hand experience working on real-world case studies for companies such as Coca-Cola, American Airlines and Toyota. As a member of MAAF, you’ll have meet students who share your curiosity about the world of advertising and passionate desire to join the industry. We offer opportunities to gain recognition, network with professionals, build experience, receive professional advice and have access to important tools and resources. We are more than just a club: We are a student agency. To learn more please visit http://www.jmuadclub.com or email jmuadclub@gmail.com. You can also visit their BeInvolved page. Mu Kappa Tau National Marketing Honor Society (MKT), the only marketing honor society recognized by the Association of Collegiate Honor Societies (ACHS), is open by invitation only to students who achieve the highest academic standards, including a 3.25 or higher GPA. Juniors must rank in the top 10 percent of their class of marketing majors to qualify for admission, while seniors and graduate students majoring in marketing must rank in the top 20 percent of their fellow marketing majors. MKT members may apply for the organization’s many scholarships, post their resumes or review job openings on Pi Sigma Epsilon's (PSE) Job Board, or attend the MKT Annual Business Meeting held in conjunction with the PSE National Convention. Pi Sigma Epsilon is the only national, co-ed, professional fraternity in marketing, sales management and selling. PSE is open to students in all majors because we believe that everyone can benefit from learning the essential tips and tricks to help market themselves to achieve success. PSE offers its members both professional and service opportunities, including resume workshops, mock interviews and presentations by business leaders. The JMU Professional Sales Club was established to develop skills and knowledge in sales, advance careers, and broaden networks through interactions with leading businesses and professionals. As an organization, we want to help all students that are interested in sales and give them the knowledge and skills they need to be successful in a professional sales role. The JMU Professional Sales Club hosts many events including; resume workshops, corporate presentations and gatherings, LinkedIn tutorials, networking opportunities, and job/internship fairs. We want to teach our members about the world of sales and the proper techniques to be a successful salesperson. We want to motivate them to have the mindset that they can become successful salespeople and enjoy what they do. For more information email us at jmupsc@gmail.com.